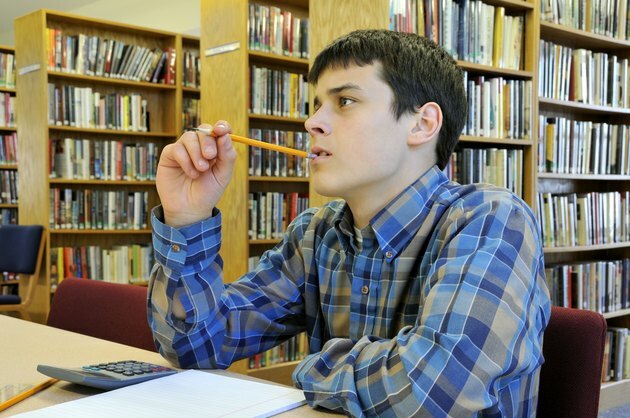 If you're concerned that your teen might have attention deficit disorder, or ADD, you have probably noticed he has difficulty getting organized and staying on task. His grades may be dropping, or he may complain that he has difficulty focusing. Attention deficit hyperactivity disorder, or ADHD, is the preferred term for what used to be called ADD, but the older term is often used informally to describe a subtype of the disorder in which inattentiveness is the main problem. This variant of the disorder may be your teenager's problem, especially if he's receiving a diagnosis for the first time during the teen years. Health-care professionals use the criteria described by the "Diagnostic and Statistical Manual of Mental Disorders," or DSM, to diagnose ADHD. Depending on his symptoms, a teen may be diagnosed with the "predominantly inattentive" subtype, the "predominantly hyperactive-impulsive" subtype or a "combined presentation" that features characteristics from both categories. Inattentiveness symptoms include difficulty with attention to detail, difficulty with prolonged mental effort, trouble with organization, being easily distracted and forgetfulness. Hyperactivity and impulsivity symptoms include fidgeting, feeling restless, trouble with waiting, interrupting and being overly talkative. For adolescents up to age 16, at least 6 symptoms from the DSM lists must be present for at least 6 months for her to receive a diagnosis of ADHD. For teens age 17 and older, only 5 symptoms need to be present. For adolescents receiving a diagnosis for the first time, past history is especially important. To get the ADHD label, symptoms need to have been present before the age of 12. While your teen may have characteristics from both lists, hyperactivity symptoms may be less obvious in an older child. Teens who did not receive a diagnosis ay a younger age are more likely to present with inattentive symptoms, rather than obvious hyperactivity. In other words, hyperactive kids usually are diagnosed earlier in life. Whether receiving a diagnosis for the first time or determining whether childhood-diagnosed ADHD still needs treatment, symptoms mentioned by teens are often subtly different from those seen in younger kids. For example, parents and teachers may describe excessive running and climbing in young children. Meanwhile, adolescents may not act out their hyperactivity, but they may describe feeling restless while sitting in class or completing homework. Inattentiveness may become more obvious than it was in early childhood, when sustained attention and concentration demands were fewer. For example, teens may mention that they have problems with staying organized or following through with projects at school. Some may also have difficulty with temper control. According to the American Academy of Pediatrics, teens may understate their symptoms and their effects. Your health-care professional will probably want to talk to you, your teen and his teachers to ensure a proper diagnosis. Some teens with ADHD may respond to their difficulties with substance abuse, which they may or may not report. Watch for signs of alcohol or drug addiction, which health-care professionals will treat first before addressing ADHD directly.